John Edward Jordan was born in Batley in late 1882, the second of three sons born between 1878 and 1887 to Patrick Jordan and his wife Ann (nee Lynch), who were both born in County Mayo, Ireland. They married at Dewsbury in Summer 1874 and in 1881 Patrick, Ann and their first child, Patrick, aged 2, were living with their Lynch in-laws on Batley High Street. By 1891, Ann Jordan is described as a widow, aged 40, and living at Smith Road, Dewsbury with her three sons. The boys were all at school and Ann was working as a rag picker. By 1911, John Edward Jordan was aged 28 years and he had moved to East Ardsley where he was boarding with a miner and his wife. He was working as a coal miner and at some later stage he moved to live on South Parade, Ossett where he probably worked the local Old Roundwood Collieries. A John Edward Jordan was married in the Sheffield Registration District in March 1908 to Ethel Whitehead and they had a daughter Margaret Jordan in late 1911. John Edward Jordan’s army service record has not survived, but it is known that he was living at Outwood, probably East Ardsley, when he enlisted at Rotherham and joined the Royal Munster Fusiliers, with service number 1308. He later transferred to the 9th Battalion, Royal Dublin Fusiliers with service number 43074 and he served with this Regiment until his death in August 1917. At some time, possibly before the outbreak of WW1, when he may have been a reservist, he had a service number 5579, which was in a block of service numbers allocated to the 2nd Battalion Duke of Wellington’s (West Riding) Regiment. The service number is consistent with a soldier who joined in late 1897 although John Edward was then barely 15 years of age. He embarked for the Balkans on 9th November 1915 and thus qualified for the 1914/15 Star to acknowledge his overseas service before the 31st December 1915. The 1914/15 Star and the British and Victory medals were awarded posthumously following John Edward Jordan’s death in 1917. 9th (Service) Battalion Royal Dublin Fusiliers was formed in September 1914 as part of K2 and attached to 48th Brigade in 16th (Irish) Division. They moved to Buttevant, then in June 1915 to Ballyhooley and then to England in September 1915, going to Blackdown. In December 1915, they landed at Le Havre and on the 24 October 1917, the Battalion amalgamated with 8th Battalion to form 8/9th Battalion. As a part of the 48th Brigade, 16th Division they were involved in the Flanders Offensive (3rd Battle of Ypres) from 7th June - 10th November 1917. 16th Division assumed responsibility for the Frezenberg (Zonnebeke) sector on the 2nd August 1917 for two weeks where hundreds were killed by heavy shelling and many suffered trench fever from the constant rain. On the 5th August, they moved to Vlamertinge Area and on the 7th August they moved to the Blue Line with their HQ at Wilde Wood. It is therefore likely that Private John Edward Jordan died from the effects of enemy shelling. 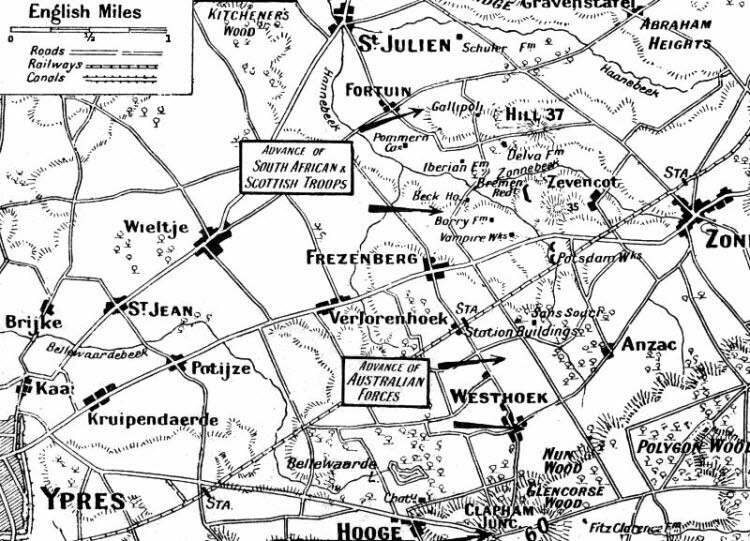 Above: Map of the area where the 9th (Service) Battalion, Royal Dublin Fusiliers were located near Frezenberg in early August 1917. 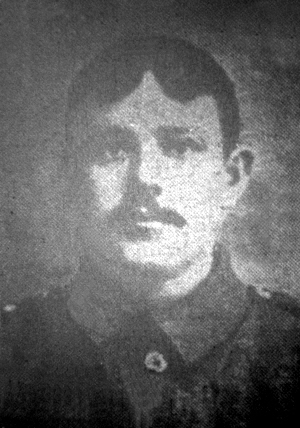 Private John Edward Jordan, aged 34 years, son of Mrs. A. Mitchell (formerly Jordan), of 7, Fountain Row, Darton, Barnsley, and the late Patrick Jordan, died on the 8th August 1917. He is remembered on Panels 44 and 46 at the Ypres (Menin Gate) Memorial, 1 Ieper, West-Vlaanderen, Belgium. Ypres (now Ieper) is a town in the Province of West Flanders. The Memorial is situated at the eastern side of the town on the road to Menin (Menen) and Courtrai (Kortrijk). The Salient was formed during the First Battle of Ypres in October and November 1914, when a small British Expeditionary Force succeeded in securing the town before the onset of winter, pushing the German forces back to the Passchendaele Ridge. The Second Battle of Ypres began in April 1915 when the Germans released poison gas into the Allied lines north of Ypres. This was the first time gas had been used by either side and the violence of the attack forced an Allied withdrawal and a shortening of the line of defence. There was little more significant activity on this front until 1917, when in the Third Battle of Ypres an offensive was mounted by Commonwealth forces to divert German attention from a weakened French front further south. The initial attempt in June to dislodge the Germans from the Messines Ridge was a complete success, but the main assault north-eastward, which began at the end of July, quickly became a dogged struggle against determined opposition and the rapidly deteriorating weather. The campaign finally came to a close in November with the capture of Passchendaele. The German offensive of March 1918 met with some initial success, but was eventually checked and repulsed in a combined effort by the Allies in September. The battles of the Ypres Salient claimed many lives on both sides and it quickly became clear that the commemoration of members of the Commonwealth forces with no known grave would have to be divided between several different sites. The site of the Menin Gate was chosen because of the hundreds of thousands of men who passed through it on their way to the battlefields. It commemorates casualties from the forces of Australia, Canada, India, South Africa and United Kingdom who died in the Salient. In the case of United Kingdom casualties, only those prior 16 August 1917 (with some exceptions). United Kingdom and New Zealand servicemen who died after that date are named on the memorial at Tyne Cot, a site which marks the furthest point reached by Commonwealth forces in Belgium until nearly the end of the war. New Zealand casualties that died prior to 16 August 1917 are commemorated on memorials at Buttes New British Cemetery and Messines Ridge British Cemetery.